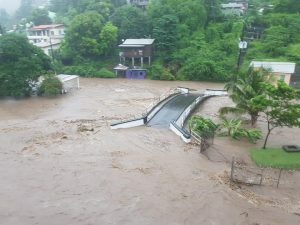 Grenada is still tallying the damage after heavy rainfall last week resulted in “wide and extensive” flooding that once again highlights the vulnerability of Small Island Developing States (SIDS) to climate change. For three hours, between 9 am and 12 noon on Aug. 1, a tropical wave interacting with the Inter-Tropical Convergence Zone, lingered over the island, dumping several inches of rain, which resulted in rapidly-rising flood waters.”We had so much rain over such a short period, the whole system was inundated, and it speaks clearly to the effects of climate change.”– senator Winston Garraway, minister of state in the ministry of climate resilience. “The flooding was wide and extensive,” senator Winston Garraway, minister of state in the ministry of climate resilience, told IPS.